All my edible images are printed on the best quality sugar sheets. This sheet of mixed confirmation .. 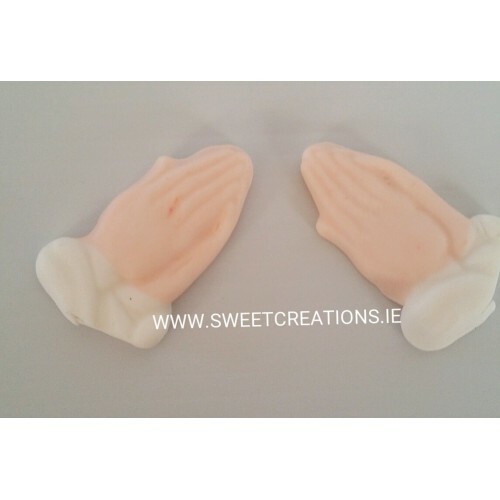 Handmade edible cake topper of praying hands. Approx. 2" x 1" in size. Perfect for communion/ confirmation cakes or any celebration cake. €2.55 per pack of 2. Here I have a sheet of 15 x 2inch cupcake toppers with an hen party theme. They are gluten free, dai.. Here I have a sheet of 15 x 2" cupcake toppers with an princess party theme. They are gluten free, d..
A sheet of 48 edible image discs, each one measuring 1.25"There are 4 options A sheet of Communion t..